Once there was a place in Spokane called Trent Alley, which might have been dropped intact from early San Francisco or Seattle – or even Tokyo or Hong Kong. In fact, this urban alley/courtyard – where the Spokane Opera House parking lot now stands – was also called Chinese Alley or Japanese Alley (or the cruder, short version of the name). Spokane’s white residents also called it “Chinatown,” which, while not exactly accurate (it was more Japanese), at least conveyed its flavor. 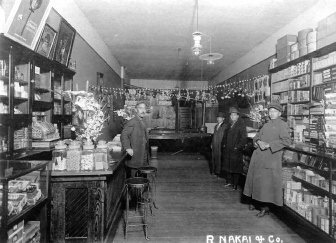 If you had strolled through Trent Alley during its heyday – from about 1890 to 1920 – you would have passed shop after shop of “Oriental” markets, bathhouses, laundries and restaurants. Yes, and even an opium den or two in the early days. Actually the district consisted of at least two separate alleyways. Trent Alley was a shady, L-shaped courtyard in the block bounded by Main and Front avenues (now Spokane Falls Boulevard) and Bernard and Washington streets. Japanese Alley was generally considered the alley just a block west, between Stevens and Washington, behind what is now Auntie’s Bookstore (although Trent Alley was sometimes referred to as Japanese or Chinese Alley as well). The district was the site of boisterous Chinese New Year’s celebrations beginning in at least 1889, complete with fireworks and dragons. The local newspapers usually didn’t pay much attention to this district until something sordid happened. Then on May 26, 1909, police raided three Chinese “fan-tan” (gambling) joints, where 40 to 50 Chinese and Japanese gamblers were gathered. Significantly, the story says that most of the residents of the district “applauded” the raids. In fact, these blocks were the center of Spokane’s burgeoning, and respectable, Japanese community. Those two blocks – and not just the alleys – were jammed with Japanese hotels, laundries and restaurants. There may have been as many as 1,000 Japanese residents in Spokane around 1910, and many of them probably lived in hotels, boarding houses and flats in these blocks. It was “practically solid” Japanese businesses as recently as the 1920s, said Spokane resident Mii Tai in a recent interview with Rose Krause, the Northwest Museum of Arts and Culture’s Curator of Special Collections. What happened to it? The population of Japanese residents, most of whom arrived to work on the railroads around the turn of the century, began to dwindle around 1924 when immigration from Japan was curtailed. Not only were there no new immigrants, but many went back to their families in Japan. Meanwhile, the community began to disperse to neighborhoods throughout the city. Finally, Trent Alley was demolished entirely in the early 1970s in preparation for Expo ‘74. So when you park there for “The Lion King” this fall, remember that it’s a place where the dragons once roamed. The Lewis & Clark Report: This was a momentous week, 200 years ago, for the Lewis & Clark Expedition. On Aug. 12, 1805, Meriwether Lewis hiked over a ridge at Lemhi Pass, on the present border of Montana and Idaho, and dipped his hand into a cold rivulet. “Here I first tasted the water of the great Columbia River,” he wrote. 100 years ago this week: The big news in Spokane on Aug. 12, 1905, was the arrival of the Big Top. Barnum & Bailey’s circus steamed into town in four massive trains, and it’s hard to imagine the excitement this caused. Attendance was around 50,000 over two days – amazing, considering the population of Spokane probably wasn’t much higher than that (the 1900 census showed only 36,848). The circus itself had 1,065 employees. “The big feature of this show is the Dip of Death, and it is just as advertised – a thing thrilling in its awfulness,” wrote a breathless reporter in The Spokesman-Review.